First and foremost, as soon as I can get a day out of the office, possibly as early as 11/23, I am going squirrel hunting. Odds are what I will do is hike to my favorite, remote patch of hardwood. Gather up some tinder and make some tea and sit and wait for a whole day and probably shoot nothing. Sounds perfect to me. Following this are two of my three favorite events in all of the US: Thanksgiving and Ohio Gun Season. 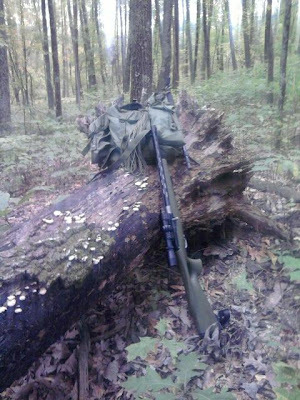 I have the 454 Encore oiled, sighted, and ready. Bucks beware. If I see something over 4 points , it's going in the freezer. Gear - I think most guys are hung up on this aspect of things. To be fair, as hunters go, I was too. My rifles are a testament to it. Given that I need to put these goals in the forefront. I figure if I can get that working I am off to a good start and we can build on it for larger trips. Trees. I need to know a lot more about trees. 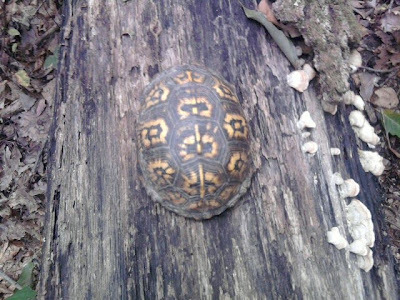 Given that I'll set a goal to be able to ID each tree I run across while out and about in Ohio by this time next year. In addition to that, I'll see if I can know which is good for what. It's a tall order however it has the advantage of being cheap to do. 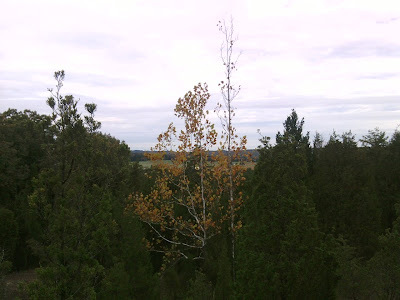 :-) Trees are in every park, info about them is available everywhere on line. Good stuff. Fire. I need to know more about fire. So, let go at it like this: I will know what goes into a tinder bundle and where to find it. I will gather it and assemble a tinder bundle and use it to build a fire with a firesteel. Also, I will make a firebow and learn how to use it. Cordage. This is an easy goal to establish. I'm going to make some. Oh yes, I will know how. Shelter. I need to learn more about this but I am not sure we can put a goal around it for this year. I'll make it the first stand by goal. This ought to keep me posting for the next year or so. I'll document the progress as I go and see if the objectives need to be altered. Big up to the guys at BCUSA for setting up. Just great folks and nice site. It has really sparked my interest. I am liking the way the scales finished up. 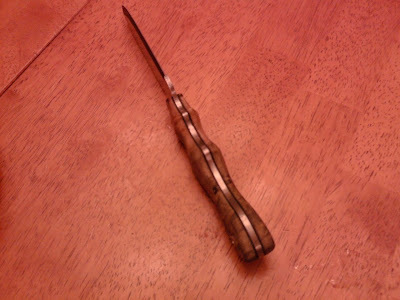 I really like the handle shape. The flare on the end really did what I hoped it would. I can hold the handle on the end with a really secure grip and when I have my hand mid grip, it provides this nice sense of security on the back. Next up... I'll have a go at a Khukuri. That should be fun. 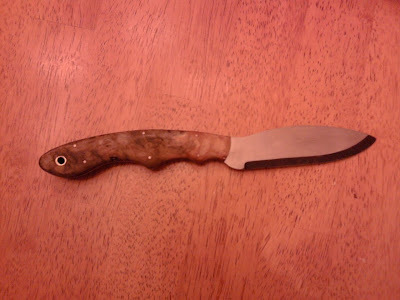 I decided to go with the Amboyna I had in inventory. So far it is coming to get very well. I'm not sure if I made this again I would pimp it quite as much as this one it. For sure, I prefer 1/16th inch pins to 1/8th. They just look nicer. On the other hand, bling or no, it looks pretty durable and feels that way too. 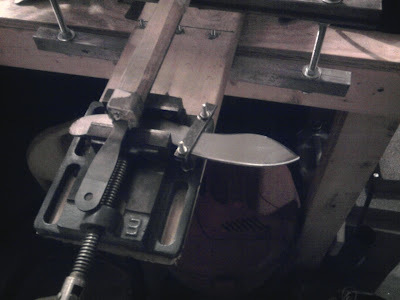 Once I am back to where I can breath again I hope to shape it up into something a lot more ergonomic. So far it feels nice in the hand even with the squared off scale edges. I'm trying something a little different on the pommel on this one. 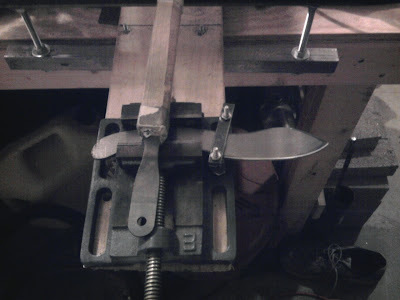 I am going to flair it out so it can be gripped further back more securely. We'll see if I can pull it off. Lots of shaping yet to do. Catching up the Nessmuk and on to the Heat Treating. 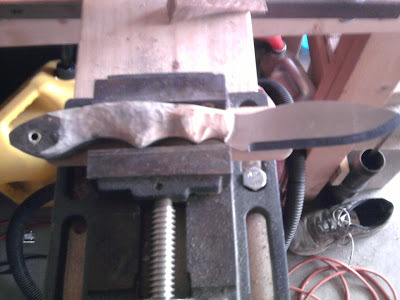 I am waffling between some Dymondwood I have that will be tough as nails and I like pretty well or going with some of the spaulted maple burl I have stabilized. Either way, 1/8" brass pins, 1/4" thong tube, mosaic pin this time. Red epoxy, red liners. Should be gorgeous. I hardened it twice trying to get it down to where it needs to be. The toaster over is on the fritz and won't hold 400 any more. It wants to hang out at 450. Had to switch back into the house. Mrs is very happy about that. Just wanted to get it documented. I have three working right now and I'll post the others when I get them further along. I got the profile work done, for the most part anyway, today and went ahead to the grind. It took some work but things are set up now. I got new files but the old one seems to still be cutting. We'll use it a while longer. The angle thingy says we're cutting at 10 degrees. We'll see I guess. I am struggling with the scales right now. 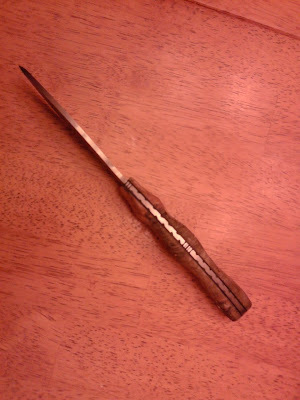 Not sure what I will use, though I am feeling Dymond wood because I want it to be tough and last. Well, a few days off and back to it. I wasn't kidding. It's time to make one of these. I just love the things. I've decided to build it as a part of set. I got the youngster in bed and set to profiling. I got cut out and rough ground. I touched it up on the belt sander and it smoothed out pretty well. I'll fine tune the profile tomorrow. I want to look at it a bit. Here's how it came out compaired to the drawing I made. I am pretty lucky, as I think I have said before, to have family that owns a few acres still covered in woods. I figured with deer season approaching and this being what I think will be last day out until after the Turkey day, I would squirrel a bit and scout for deer. I got a couple a squirrels pretty early and after cleaning them decided I had done enough for the cause of feeding the world with tree rats and decided to just have a look around. 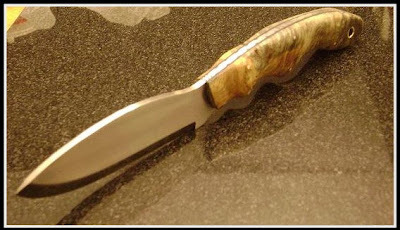 Recently, I have started reading quite a bit over on the bushcraftusa.com site and wanted to have a go at a few things I have seen there. It turns out, playing with fire is fun. 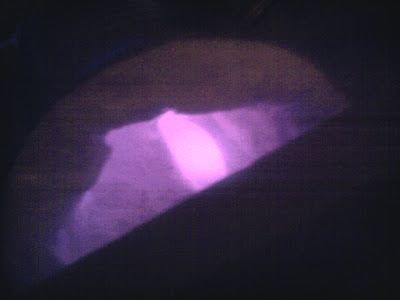 I took some steel wool and cotton balls coated in Vaseline and made myself a fire. I wish I had taken a tea bag or two. Would have been fun. Live and learn I guess. 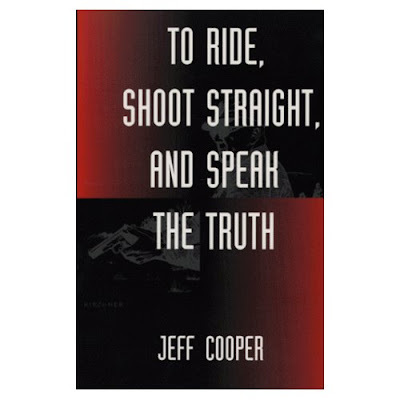 I love to read Jeff Cooper's stuff. I don't always agree with him but I like the way he makes his case. As an argumentalist, he understands both the strength and weakness of his arguments and where the rationale ends, he sees that it all just about his beliefs at that point. Having said that let's talk about this book. Readability - 5 of 5 - Cooper writes in the King's English. He's grammar and style is impeccable. Editing - 5 of 5 - I doubt the editor had much to do after this was written, however there we no mistakes. None. Did I like the story - You know, this should just be listed as an automatic 5 if I am typing it here. I loved this one as well. If you are looking for a good read on hunting and shooting, this is good place to go. This is also a good view into the mind of Cooper and a good litmus test to decide if his work is for you or not. I loved it. Excellent read. Well, it's done. I am pleased. The finish sanding went well and the wood took the tung oil with no issue. 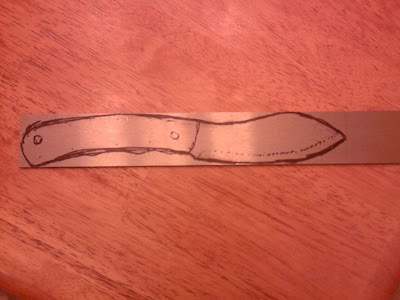 I do want to make a sheath. I'll have to make sure I have enough leather and go for it. I guess it may also be time to do somethings around the house before I get the boot from the Mrs.
Well, I decided given the perfect weather and nice day with my girl to spend my day letting her play around in the front yard while I glued bits of wood to my belt knife... ;-) I ruined a set of black ash scales yesterday and decided, in keeping with the spirit of this project, to try a different way to make the things fit. I had this old set of buckeye burl scales I had ordered on eBay and gotten ripped off over and I figured these would be good candidates. The initial fit went without incident on the second set. I drilled them singularly and then pinned them to drill the thong tube and all seems in order with the world after that. I mixed epoxy and got some clamps and went to it. 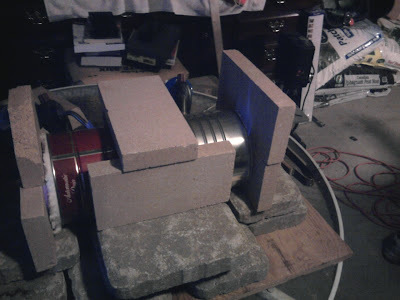 3 hours later, everything was set up enough to begin profile sanding. Again, completed with out incident and contouring began. The file work is looking very nice and I think I will be pleased with it just the way it is. I am really pleased with this project so far. I will probably give it as a gift this holiday season but until then, I'll pack it around a bit and see what it's good at. The next one may be something special. I have got to get something else to do. This is a serious issue for me. 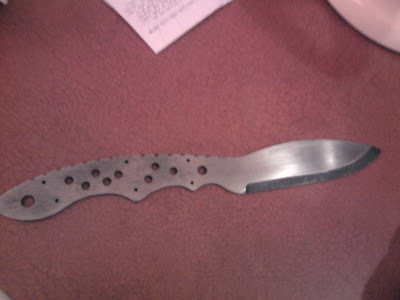 It's about 10 till 2 and I am just wrapping up a day of working on this knife. I figured since I had the day off and it was raining, why not. Anyhow, the grind is completed. 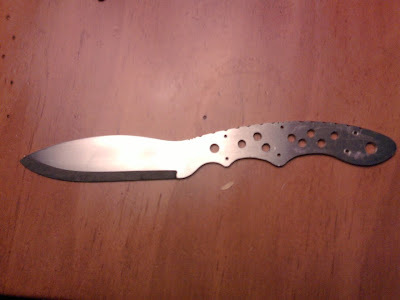 I spent a fair amount of time sanding and de-scratching blade flats to day. Also put on some file work. Not sure how it will look in the end so no pics yet... Here are then, all ready to start normalizing. No normalizing issues and so I paused for dinner. 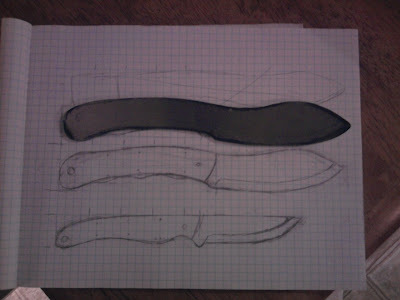 A friend came over and we talked knives and knife making for a while. He's all interested. It was darned fun, like watching a kid in the candy store. He was all excited by the double can forge spewing blue flames. When the fire brick got pink, he got even happier. 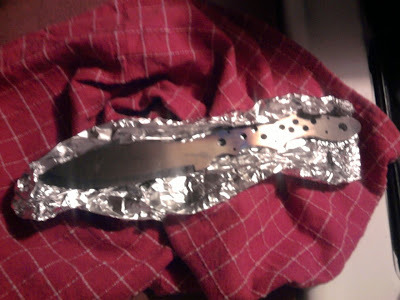 I paused a couple times during the actual run-up to hardening to check the blade. Dude was ecstatic about the mid to light orange color it was turning in the heat. That is just hard as heck to photo. 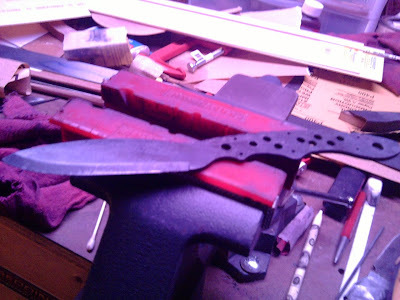 Here's the blade all hotted up in the forge. Here we are coming out of the over about 10 minutes ago, all nice and straw colored. I am digging it but now I am going to bed. What a great day.